You probably didn't see this one coming, but one of the biggest challenges new optometrists face is having an income for the first time. Living on loans for so many years of school, your first paycheck is an amazing luxury. And then every 2 weeks you get another one. But having an income can be a serious trap; we've all worked hard to get to this place where we finally can do things, buy things, travel, eat out, buy a new doctor appropriate wardrobe. With the luxury of having money for the first time comes a new problem -- you need to decide what to do with it. There is a strange paradox of having a great paycheck coming in (feeling you've made it! ), but being deeply in debt from undergrad and professional school loans (nope, actually you are really, seriously broke still). Managing your money properly in those first few years after getting your first job can set the stage for your future financial success. Today's guest is Dr. Syed Hussain, the writer behind the informative and extremely readable financial strategies blog for professional students, The Broke Professional. 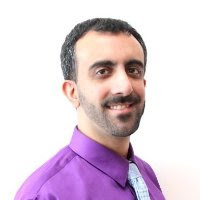 A 2009 graduate from the Pennsylvania College of Optometry at Salus University, Dr. Hussain has worked in nearly every type of modality of eyecare. He saw himself and fellow classmates struggle with financial decision making and planning after graduating, despite having good paychecks, and decided to do something about it! Why did you decide on optometry? I come from a family of pharmacists which drove me to optometry since they warned me not to become a pharmacist. All joking aside, I always wanted to work in the healthcare field and wanted a position that wasn't super stressful, has plenty of practice options and great income potential. Optometry seemed like the best choice to me and still does. My blog is primarily a personal finance blog, a subject which I knew nearly nothing about when I graduated. After some self education at my library and online, I found I really enjoyed the subject. Talking with a lot of my colleagues and other young professionals, I also found that the vast majority of them were making huge and obvious financial mistakes that could be easily remedied. I started my blog with these people in mind; young professionals who had great career and income, but were almost clueless when it comes to finances. I felt we spent all these years studying and struggling to get into well paying and stable professions so it is essential to ensure we are making sound financial decisions and staying away from huge financial blunders. What's the biggest initial financial mistake new grads make? By far the biggest financial mistake I've seen people make is inflating their lifestyle way too much once they start working. Just because you make a certain income, it doesn't mean you have to spend that income. Leasing luxury cars and buying new homes is great, but I would caution not to make big purchases like that right after school. There are lots of expenses for new grads, including student loan payments, transportation, rent, clothes, association dues etc. Keeping these expenses to a minimum is crucial in the first few years of working, as this will set the stage for the rest of your financial life. Continue to live like a student for 2-3 years after graduation and get your financial house in order by paying off debt and saving money for an emergency fund or house down payment. You've worked in private and corporate settings. What made you to decide corporate optometry was right for you? I have been working full time in a corporate setting since 2010. I enjoy corporate practice because I can still fully treat patients how I'd like and have free time outside of work to spend time with family and pursue my other passions (like blogging!). What percentage of your paycheck should you put towards student loans? Like the answer to many personal finance questions, it depends. There is no one number that works for everyone. I know new grads who devote all of their disposable income towards student loans and want to get rid of them ASAP. I know others who have other obligations that come first and just do the minimum on their student loans. I recommend something in the middle depending on your tolerance of having debt. If you have student loans at 2% that you're attacking aggressively (just an example) and are not contributing anything towards retirement, then you might want to shift some of that spending towards retirement so you can let those contributions compound over time. Whatever extra you decide to put towards your loans, make sure it's towards the principal of the loan with the highest interest rate. How long after graduation should you be debt free? Again, it depends. Student loans aren't the worst loans to have as the interest rates are pretty low compared to other types of loans, and interest payments may be tax deductible. But I wouldn't take the whole 25 or so years to pay them off because you will be paying a lot of interest over that time. It also depends on the amount of indebtedness after school. Some people have debt well into $200,000. To get rid of that in 5 years is probably not realistic. There are a lot of good calculators and services (Ready For Zero is a great one) which will show you when your loans will be paid off depending on how much extra you pay. I would recommend playing with these calculators and find a comfortable time frame to pay them off. Then be consistent and plug away! What should new grads prioritize besides student loans? It's really important to pay off student loans, but not at the expense of other things. The biggest asset for most OD's is their income, and how to handle catastrophic situations where your income is not there. Whether working for a company or being out on your own, disability insurance is important for income replacement in the case of an injury or illness that puts you out of work for a while. Next I would consider life insurance, especially if you have a family to support. This will help your loved ones in case the worst happens. Life insurance is pretty cheap, especially if you're young. Once the catastrophic situations are taken care of, it's important to at least save something for retirement. Retirement is the last thing on most new grads mind, but it makes it even more important to contribute early since it gives more time for your contributions to grow. Investing can be complicated, so I recommend new grads do some research and read some great books and blogs. But the two things that effect investment returns the most are contribution rate and time to grow. So contribute early and often in your career. What can student doctors do before graduation to prepare themselves financially? I have to admit, when I was in optometry school I didn't really think about financial issues. With exams and practicals around every corner, there was no time for anything else. But during four years of school, I know I could have done a little more to prepare myself. Self education is essential, so get your hands on some good books. A couple of good ones to start with are The Richest Man in Babylon and The Millionaire Next Door. They will teach you how to keep more of your money and get you started in thinking about personal finance. Also, talk with OD's who are already a few years in! Much wisdom can be had from those who have been through what you have. Shameless plug: you can contact me via my blog and ask me any questions you may have. It's obviously very important to do well in school, but having a semblance of a financial plan in place will give you a great head start.